My little one came down with a cold this weekend, so in addition to digging out the old Atari game system from the basement and finding a deck of cards for something to do with a sick toddler, I wanted to make some comfort food. My husband and I both grew up occasionally eating tapioca pudding — it’s sweet, creamy, and easy to eat, so it was something I welcomed as a sick child. But this weekend seeing a nutrition label with lots of zeros made my eyes wander away from the tapioca box to other shelves in my pantry until…Aha! 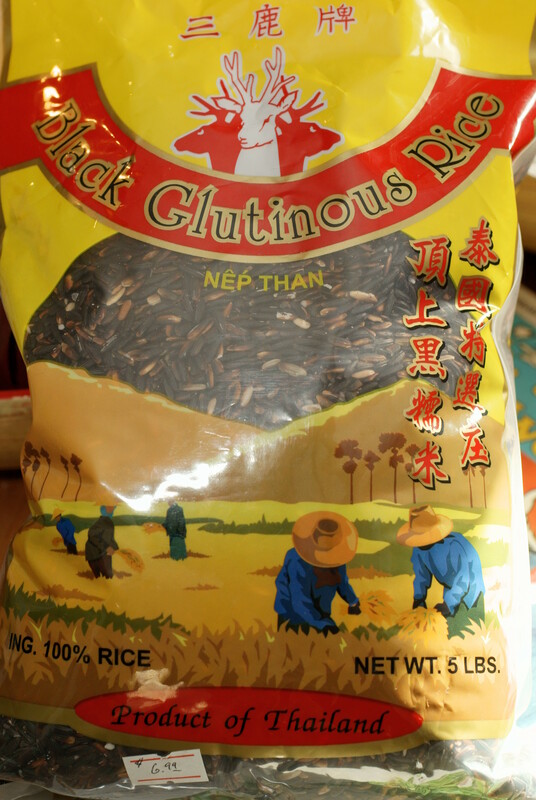 There it was: Lots and lots of Thai Black Glutinous (Sticky) Rice waiting to be appreciated. I found a 5 lb bag of this rice at a local Thai grocery store for $6.99 some time ago and it has been sadly neglected in recent months. But no more, because it’s delicious and oh so healthy! Some recipes insist you must soak the rice overnight before cooking, but others do not, so I tried both methods and found the only difference to be the soaked rice cooked in 30 minutes, versus 40 minutes needed without the soaking process. Either way, you do have to rinse this rice several times before cooking, but that only takes a minute. After rinsing, it’s no harder than cooking brown rice, so don’t be intimidated. 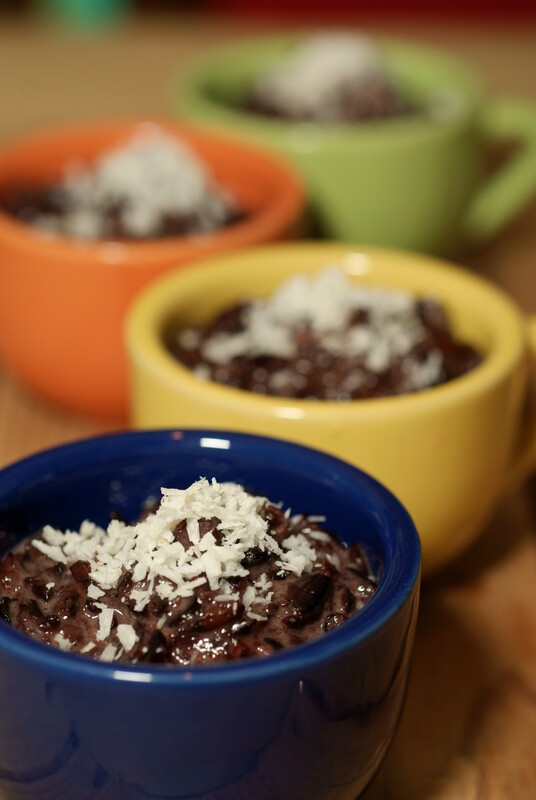 If you’re a fan of rice pudding, or looking for an alternative to dairy-laden processed tapioca pudding like I was, this is an awesome pudding that’s suitable for a whole-grain snack, dessert or breakfast. Also, don’t let the prunes turn you away. Seriously, if the thought of dried plums doesn’t appeal, try to recall the last time you ate one, and the last time you had one cooked in a pudding. They’re quite good, and like using dates or raisins, an easy way to sweeten foods naturally so you can skip the refined sugar. 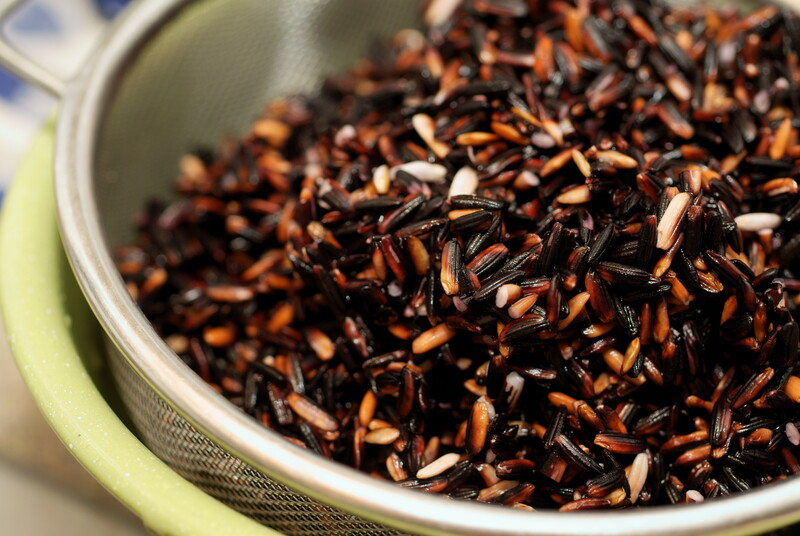 Black rice, just like brown rice, has not been stripped of its bran hull, so it maintains all the nutrients that are lacking in processed white rice, such as fiber (8% daily recommended value), protein (4 grams), B-vitamins (20% Vitamin B-1, 8% Vitamin B-2) and iron (8% daily recommended value), as well as high levels of anthocyanins – an antioxidant found in purple and blue fruits, manganese, magnesium and selenium. It’s so easy to boost your nutrition simply by replacing processed grains with whole-grains. Children tend to eat much less when not feeling well (and don’t we all), so it makes sense to put extra effort into offering nutritionally dense foods when their little bodies are working so hard to fight an infection. Check out an international foods market in your city, or order some of this amazing rice online. Using a fine mesh strainer, rinse black rice 3-5 times in cold water, until water is mostly clear. Place in medium saucepan with tight fitting lid with 6 cups water and 1/8 t. salt. Heat to a boil, reduce to a strong simmer, cover and cook 40 minutes or until rice is tender. Drain excess water, then return cooked rice to pot. Add coconut milk and remaining ingredients, saving shredded coconut for garnish (or add extra if you like the texture and flavor…it is delicious). Cook over low heat 3-5 minutes to desired consistency. The pudding will thicken as it cooks. 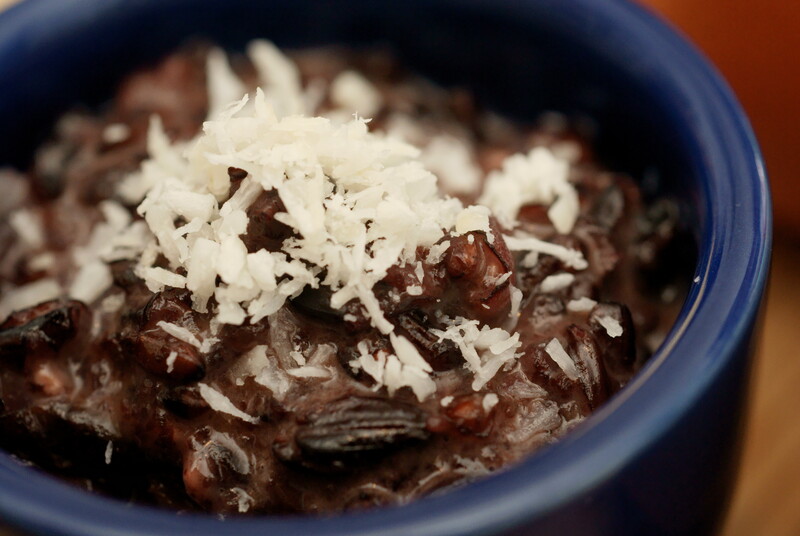 Serve warm with shredded coconut.